Athens and the surrounding areas are fantastic places to go birding. Our area receives a large number of neotropical migrants and it is not uncommon to see 20+ species of warblers during spring migration. Since you can't be everywhere all the time, the Oconee Rivers Audubon Society maintains a site that allows anyone to post local bird sightings and sign up for email alerts that let you know when and where birds were seen. To view and/or subscribe to the sightings page, visit http://www.quicktopic.com/29/H/6JbdZFsuhUc6. Subscription is not required. Also, if you would like to see what others are reporting from around Georgia, you can view sightings here: http://birding.aba.org/maillist/GA. We hold weekly bird walks during the spring and fall. Check our calendar for upcoming walk locations and times. 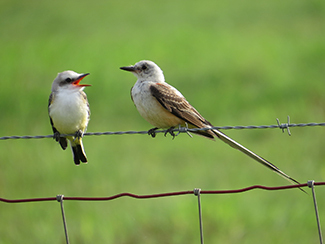 Photo: First breeding Scissor-tailed Flycatchers in Oconee County 2013.